BRYAN EATON/Staff photo. Third and fourth grade classes at Amesbury Elementary reunited with the Amesbury Council on Aging volunteers that come to school for the 6-week Bridge’s Together Program on Friday. 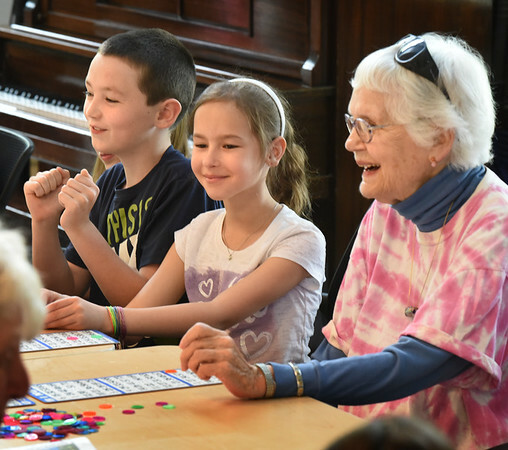 The students went to the Senior Center to reconnect, donate two quilts, and enjoy ice cream and play bingo. Each of those pictured are happy with the last bingo callout, from left, Max McCue and Sophia Hanig, 9, and Jody Perkins.